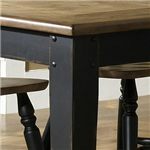 This x-back counter height chair is a perfect addition to the counter height table or pub space in your home. 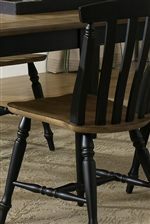 Featuring traditionally turned spindle legs and a double x-style back with wood contoured seats, this cottage-like and and cozy chair adds a homey feel with its presence. 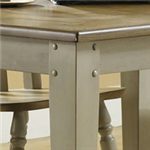 A two tone finish lends visual depth and dimension to uplift and refine, making a truly lovely traditional addition to your home. 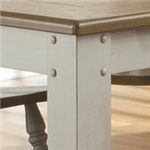 The Al Fresco II Counter Chair with Double X-Back by Liberty Furniture at Dinette Depot in the Brookfield, Danbury, Newington, Hartford, Connecticut area. Product availability may vary. Contact us for the most current availability on this product. Finish & Paint Options Sophisticated and high-end quality finishes available with a reputation for strong competitive advantages, distinctive appeal, and a high level of perceived value. The Al Fresco II collection is a great option if you are looking for Casual furniture in the Brookfield, Danbury, Newington, Hartford, Connecticut area. 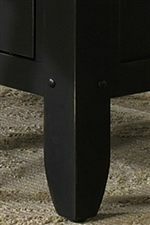 Browse other items in the Al Fresco II collection from Dinette Depot in the Brookfield, Danbury, Newington, Hartford, Connecticut area.